More exciting news to share! 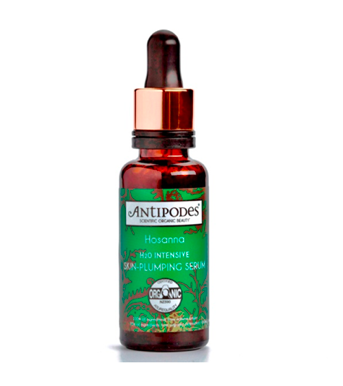 I just heard through the grapevine (pun intended...you'll get it in a min) that Antipodes are set to release a new serum that is designed to plump, smoothen and quench the skin! It's called Hosanna H2O Intensive Skin Plumping Serum and it's a high performance serum for boosting skin hydration and tone. Made with Vinanza grape, natural grapeseed extract and extract of mamaku black fern this serum is organically certified, uses bioactive technology and is oil free! Obviously named H2O it's a water-charged formula that rapidly hydrates and quenches thirsty skin, this plumps the skin and makes it smoother, more toned and look brighter and fresher. Thanks to the grape extracts it is also a powerful antioxidant for the skin, leaving it clear and purified! Designed for daily use this serum will cost £28 and will be available in the UK (already available in Aus and NZ) sometime around mid-september, in Selfridges and other stores as well as Antipodes online site.